Notes: Adults were asked if they had smoked at least 100 cigarettes in their lifetime and, if yes, whether they currently smoked cigarettes every day, some days, or not at all. 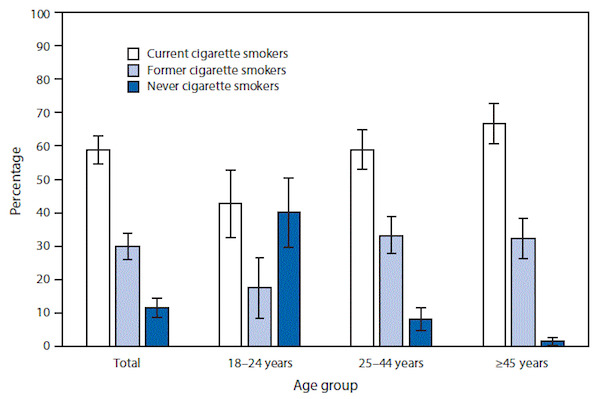 Those who smoked every day or some days were classified as current cigarette smokers. Adults who had not smoked 100 cigarettes were classified as never cigarette smokers. Adults who had smoked 100 cigarettes but were not smoking at the time of interview were classified as former cigarette smokers. Percentages are shown with 95% confidence intervals. Current e-cigarette use was based on responses of “every day” or “some days” to the question, “Do you currently use electronic cigarettes every day, some days, or not at all?” asked of adults who had ever tried an e-cigarette, even one time. Estimates are based on household interviews of a sample of the noninstitutionalized U.S. civilian population aged ≥18 years and are derived from the National Health Interview Survey sample adult component. This entry was posted in Medicine and Society Data Watch on November 2, 2016 by Genevra Pittman.